This is a photograph showing the ballroom in the clubhouse at Lake Quivira, Kansas. The people are possibly involved in a play or program. 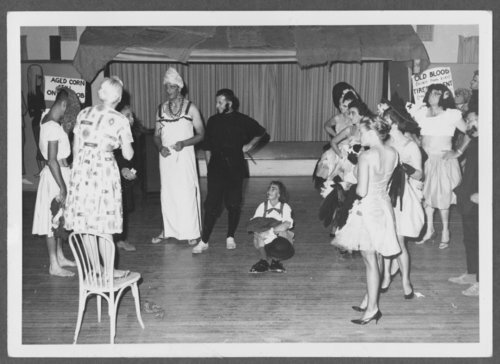 People in the photograph are identified as Jim Trickett, Elsie Reitz (on chair), Jack Horner (in drag), Phoebe Kennedy (on floor), can-can dancers (Levon in front) and Marshall Wilson (in drag). Lake Quivira had 900 acres of restricted residentail and recreational property.